Getat Watch Company is an e-store run by a watchmaker who specialized in custom watches and parts inspired by military timepieces of the Pact of Steel countries, namingly German and Italian. Unlike most eBay sellers, Getat Watch ensures that all dials are coated with Swiss luminous compounds. The cases are available in different sizes and with different surface finish. The movement catalog features affordable Chinese UNITAS clones. Straps are hand-made, and there are several colours of thread to choose from. 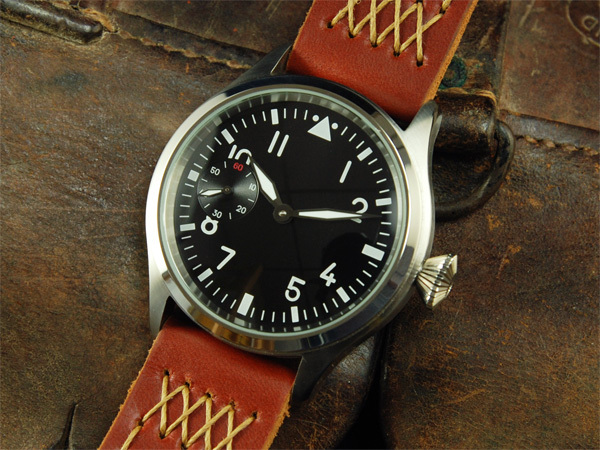 I saw a watch posted by a friend of mine and I am looking to have one made as well. Not sure where to go. Hello, maybe i can do something for you. Website isn’t finished yet, and not yet in english. Just mail if you want more to know. Hello, i can give you my perspective on your project. I can make the technical (cad/cam) and appearance design and i can make a working prototype and small series if it is whitin the possibilities of my machines. Please contact me through my site-email, it is better to have a direct contact for more details.